Who is the Plan Sponsor? Who is the Plan Administrator? Who and What is a Fiduciary? Who is the Third Party Administrator (TPA)? What are 3(16) Plan Administration Services? What are the timing rules for submitting employee deferral contributions into the plan? What is a Controlled Group (Code Section 414(b) & (c))? What is an Affiliated Service Groups (Code Section 414(m))? What am I supposed to give a new employee regarding the retirement plan? How do participants enroll in the plan? How does Automatic Enrollment work? How do I submit participant information changes? How do participants make investment changes? How do participants change their salary deferral into the plan? How do I track participant beneficiary elections? How do I submit participant contributions and/or loan payments to the plan? How do I process a Required Minimum Distribution (RMD)? How do I remove the small balances of terminated participants from the plan? How can a participant request a loan? How do Qualified Domestic Relations Orders (QDROs) work? Do I have to provide plan notices to participants every year? How do participants receive statements? Can participants access the plan using their phones? What is the Service Center phone number? Does Sentinel offer financial education on the website? Does Sentinel offer webinars for additional training? What are the Sentinel Alert emails I receive? Does Sentinel provide information about the market conditions? When do our employees become eligible to participate in the retirement plan? I have questions. Who do I contact? Fidelity Bond and Fiduciary Liability Insurance, what is the difference and do I need it? How do I access the Vault? What is the FundScape Report? What does it mean to have a fund on watch? Does my plan need an Investment Policy Statement? What is Revenue Recapture and what does it mean to my plan? What specific events (“triggering events”) can be Qualifying Events? When must the initial notice be sent to covered employees and spouses? What are the premium payment deadlines regarding COBRA coverage? How does COBRA continuation coverage requirements apply to Cafeteria Plans and other Flexible Benefit arrangements? Who is entitled to COBRA Coverage? What plans are subject to COBRA? What triggers the obligation to offer COBRA coverage? What is the purpose of the Initial COBRA Notice? Does each Qualified Beneficiary have independent election rights under COBRA? IQ or EQ: What’s More Valuable to Your Company? 1. The navigation strip across the top of your sponsor dashboard has the following option: Employee Management. Hover over this option and select Find Employee. 2. Search by Last Name by typing into the Last Name field and select “Submit”. Once you see your employee, click on their social security number. 3. You should now be on the employees dashboard where you can select any of the menu options – as if you were the participant themselves. 4. If you are looking to make personal information changes, in the upper right of your screen you should see an icon that looks like a gear (if you do not see this icon, you may need to update your security profile – please contact your plan consultant). 5. Select this gear icon and select Personal Info. Update any applicable information and select “Submit”. 6. Any saved changes should trigger a notification to the participant of the changes made (provided an email address is part of their personal information). © 2019 Sentinel Benefits & Financial Group, All Rights Reserved. Sentinel Benefits & Financial Group and eMoney Advisor, LLC, Broadridge Investor Communication Solutions, Inc., and Zywave, Inc. are separate, unaffiliated companies that are not responsible for each other's services and products. Financial planning and investment advice are offered through Sentinel Pension Advisors, Inc., an SEC registered investment advisor. Insurance products offered through Sentinel Insurance Agency, Inc. Investment brokerage services offered through Sentinel Securities, Inc. Member FINRA & SIPC. 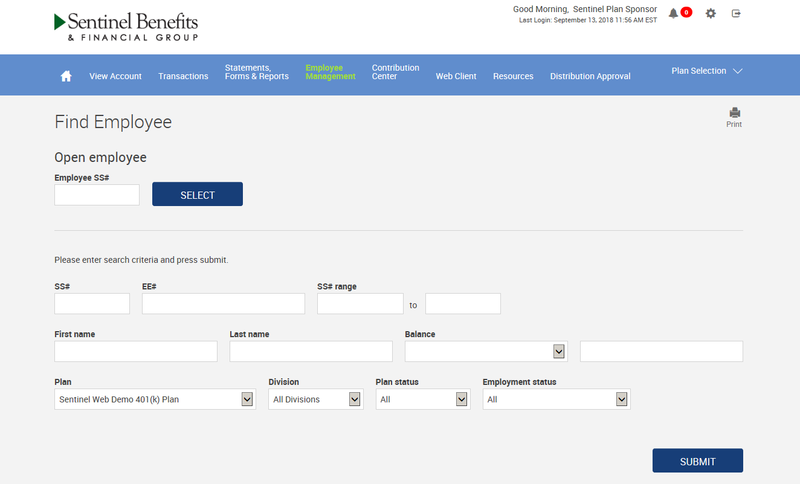 Sentinel Benefits & Financial Group is the brand name for the Sentinel family of companies which includes Sentinel Benefits Group, Inc., Sentinel Pension Advisors, Inc., Sentinel Insurance Agency, Inc., and Sentinel Securities, Inc.
Sentinel Benefits & Financial Group and its affiliates do not provide tax advice. All information has been obtained from sources believed to be reliable, but its accuracy is not guaranteed. The information provided is for educational and informational purposes only and is not intended, nor should it be interpreted, as an offer, solicitation, or recommendation to purchase or sell any security mentioned.